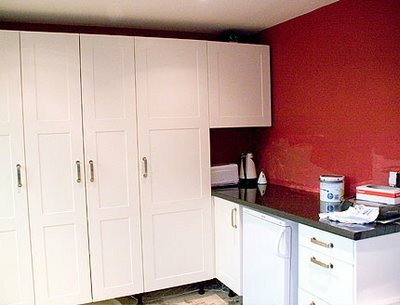 We had originally planned on having open shelves in the alcove at the end of the pantry units, but later decided to put another kitchen unit in there. I picked one up at Ikea on Monday and last night we fitted it - we still need to find the handle, though. Can't think where it's got to. 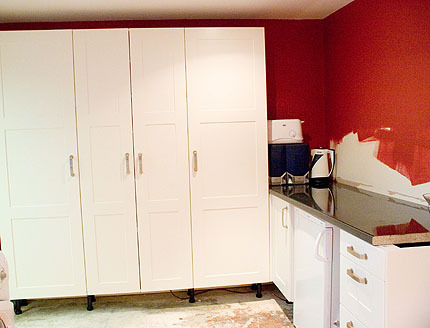 I've also decided to paint the red walls down to the worktop and have started with the first coat. We won't be able to afford to tile for a while and at least this way the room will look a little more finished in the meantime.